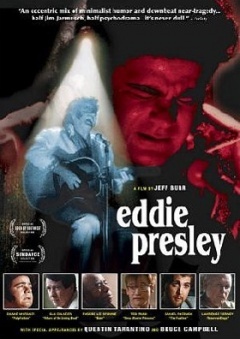 While shooting Reservoir Dogs back in ‘92, Quentin Tarantino took a few hours to play a mental institution orderly in Jeff Burr’s film Eddie Presley, based on a stage play by Duane Whitaker, who would later play Maynard in Pulp Fiction, and who wrote the sequel to From Dusk Till Dawn. The cameo was alongside Bruce Campbell, and Q’s character Hospital Orderly is a well-known name with Tarantino fans all around the world who’ve skimmed his filmography, but hardly anyone has ever seen it, partially because most of it fell victim to the scissors and never made it into the movie. If you want to know when Tarantino started wearing scrubs, if you want to close a gap in your own Tarantino DVD collection, if you want to know how Lawrence Tierney throws sandwiches at directors, here’s the first film we would like to point out to you.